The Green Rooster, Minden Place, St. Helier, Jersey, JE2 4WQ. Thursday 29th May 20:00 to 23:00. Friday 30th May 20:00 to 23:00. Tickets available £15 in advance. Visit the bar or call +44 (0)7700 707171. 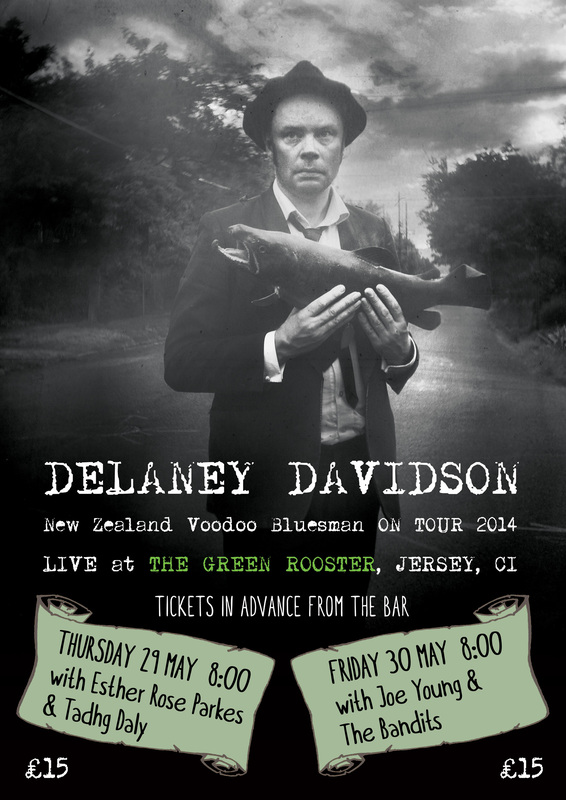 For two nights only in May 2014, the prolific, brilliant singer-songwriter and master of weird country and phantasmal blues, Delaney Davidson of New Zealand is performing at The Green Rooster in St Helier. Tickets are available now from the Green Rooster’s bar, priced £15 for each night. Both shows start at 8:00 pm, and take place in the atmospheric, intimate setting of the Green Rooster’s upstairs live stage room. It is advisable to arrive by 7:00 to get your drinks and a place for yourself ready for an evening of enthralling, unforgettable live entertainment. Jersey audiences have a long-established passion for blues, country and folk music, and especially for artists who mix and bend those traditions in new ways. From the Jersey Folk & Blues Club of the early ’90s for which Asylum founder Chris Almond was Master of Ceremonies, to more recent times with the celebrated Robert Tilling Series, this has proved to be true. These shows this month could not happen without the support and friendship of The Rogue Stage, founded by Karin and Barry Vincent formerly of Jersey as some of our friends will know. The Rogue Stage runs live events of alt-country, folk, world, dub and jazz in Rotorua, New Zealand. The Green Rooster in partnership with Asylum has selected different local musicians for each of the two nights to support Delaney Davidson. Here are the line-ups for each of the evenings with links to their Facebook pages. One rotten apple ruins the whole barrel, but then I think we all need a few rotten apples, and sometimes that’s where the flavour comes from, ripe vs. rotten, where does one cross over into the other ..? Necessity is the mother of invention, and a low budget will lead to all sorts of beautiful stand-in potential. Whistling instead of violins … I love to see things take a step, and I think people like to see the triumph of a good idea over a slick production, I think it gives them hope and inspiration. Ultimately the result of hi gloss is alienation and a removed and depressed let-down feeling of not being good enough. I say let it all go! As well as Delaney’s several collaborations with Marlon Williams, he released four solo albums between 2007 and 2011: Rough Diamond (Stink Magnetic, 2007); Ghost Songs (Casbah Records, 2008); Self Decapitation (Voodoo Rhythm, 2010); Bad Luck Man (Voodoo Rhythm, 2011). Now, in 2014, after two successful albums on legendary label Voodoo Rhythm, Delaney Davidson is back with his fifth solo album, ten new amazing gems of gothic folk-noir with a lo-fi rock sensibility. The album, Swim Down Low, is released on Outside Inside Records and distributed by Rough Trade. Put to tape over a week with Matt Bordin and Davide Zolli from Mojomatics, Swim Down Low displays plenty of Davidson’s self deprecating humour and augments his gothic folk-noir with more of a cinematic widescreen vista than we’ve heard before on his records, with some notable trumpet work that finds a cosy middle ground between Calexico and vintage Italian cinema. […] If you don’t have the chance to catch him live (where he really shines), then Swim Down Low is an eminently suitable alternative. The videos for Delaney Davidson’s songs, a selection of which are linked-to below, are not the usual man-on-a-stage miming kind of affairs. 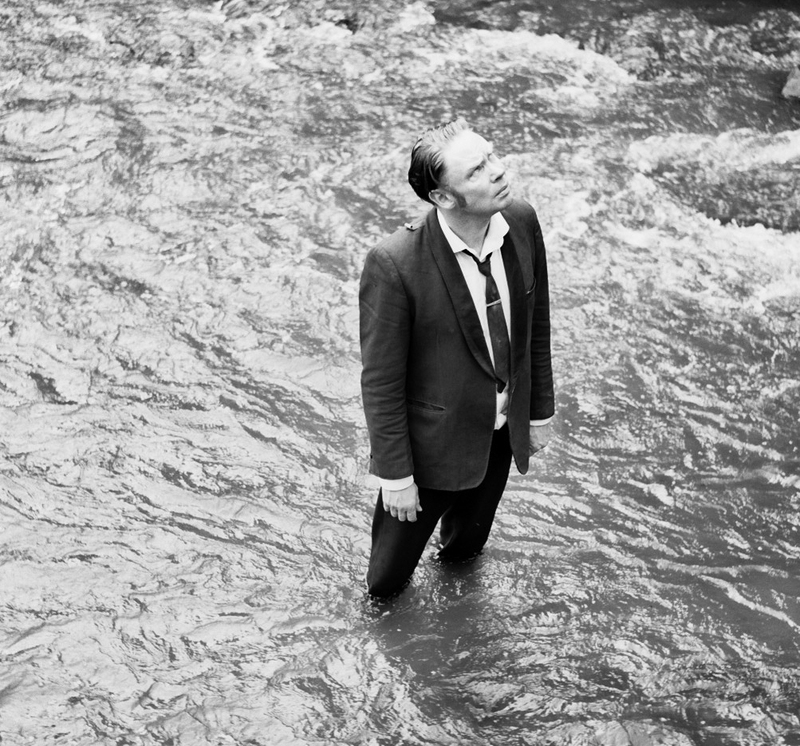 With songs that are miniature fables of fateful love, fatal loss, loneliness, corruption and madness, these beautifully produced short films reflect the music’s bad trip atmosphere and reveal Davidson’s talent as an engaging physical actor. With a European background which takes in Germany, Sweden, France, the UK and the Channel Islands, Esther Rose Parkes draws on a complex tapestry. The Channel Islands were her second home from the very beginning and Esther now lives in Jersey. She studied social anthropology at Sussex University out of the desire to explore collective cultural imagination and otherness. After a Scandinavian tour with Maria McKee, Esther spent three years in Sweden resulting in the making of the album The Other Country produced by blues musician Brian Kramer. The album was launched at the Green Rooster, Jersey, in 2013. In 2014, so far, Esther has returned to Stockholm to perform songs from her album reunited with members of its original musical cast, and assembled a new band in Jersey with Chris Herbert (bass), Dan MacFarlane (guitar, keys), Sam Willcocks (drums) and Naomi West (backing vocals). 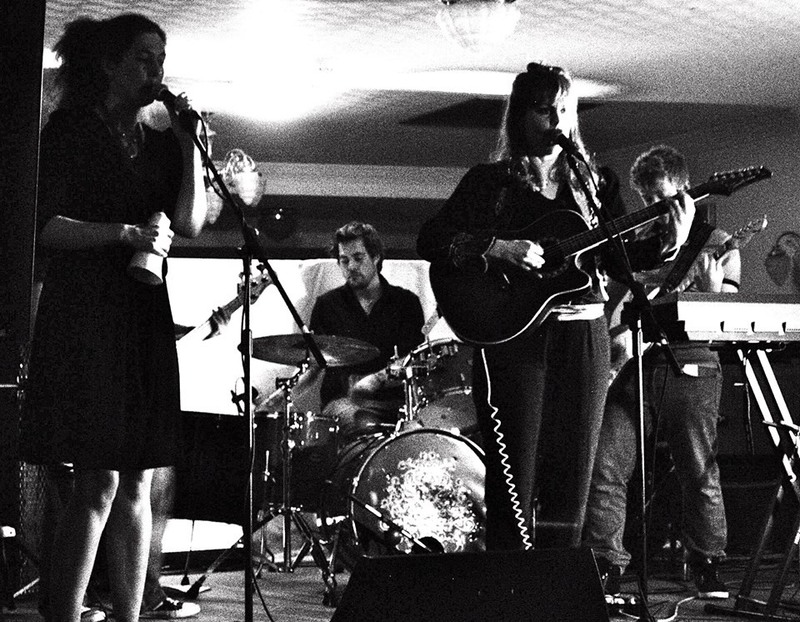 The first live appearance of this line-up was at Hotel de Normandie for Asylum’s show with Barringtone. Their performance on that night was a sequence of cool soul and folk fusion, subtly arranged, haunting and edgily modern. With her latest collaborators Esther has found a style that is strikingly different from the Stockholm sound of her album and the live shows that followed its release. The key to understanding her art is that it moves with mystery. 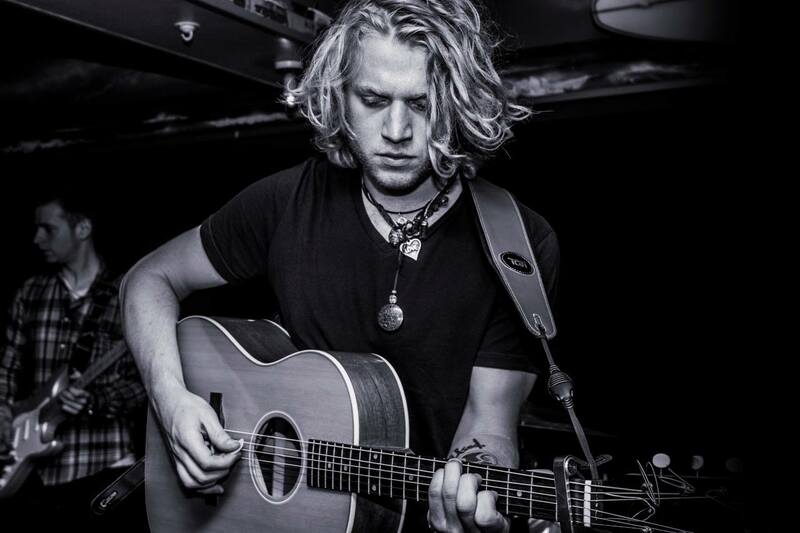 Tadhg Daly is a young Jerseyman whose songs are romantic and dramatic as the Celtic folk ballads that are a clear influence on his work. With a band of superb musicians at his side, and in Stoked Music a management team that has guided the celebrated Lloyd Yates along a path to acclaim, Tadhg has a promising future in store. Performing in Tadhg’s band are Matt Romeril (bass), James Aitchison (electric guitar), Jack Townsend (drums) and Zach Pygott (electric guitar). 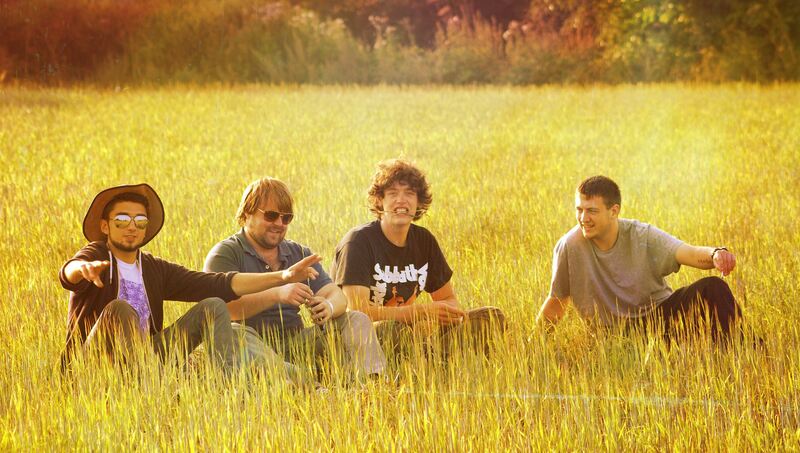 Tadhg and the band recorded their single Learn To Live at The Bunker studio with producer JP Le Blond. A revolutionary gang of four, Joe Young & The Bandits play tight and vigorous garage blues evoking the ’70s southern rock genre with a nod to its latter-day interpreters like The Black Crowes and Drive-By Truckers. There is an experimental urge at work too; as the band says, “We aim to expand and develop our sound to encompass our wide array of influences as well as our personal growth as musicians and people.” Martin O’Neill is a vitalising force as front man and singer, backed by Eddie Laffoley (bass), Greg Alliban (guitar) and Chris Skelhorn (drums).